Looks like Jameson have decided to get into urban gaming. The Jameson Shoreditch Open is being held today, I imagine as part of a repositioning strategy to drive salience for the whisky brand with those trendy young things of East London's cultural capital. 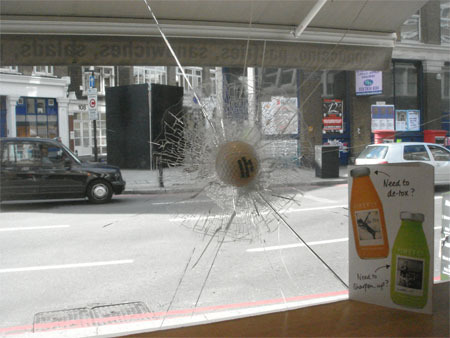 The golf ball through the window shown above is part of the local amplification campaign. Nice and relevant - similar to something Apple Stores did in the USA.